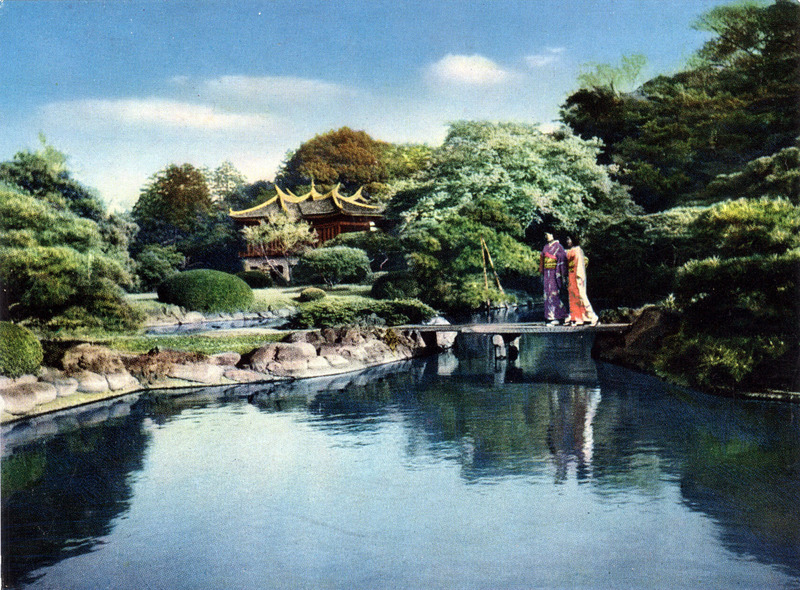 Shinjuku Gyoen (Garden), c. 1960. “The site of Shinjuku Gyoen National Garden was once part of Edo residence of daimyo Kiyonari Naito who, as a vassal, was given the eight states around Kanto region by Hideyoshi Toyotomi in 1590. The residence once stretched east to Yotsuya in east, to Yoyogi in the west, to Sendagaya in south, and to Okubo in north, where the strategic points of crossing between the Koshy-kaido and Oume-kaido into Edo to the west, and Kamakura to the south. Because of the military purpose, Shogun Ieyasu Tokugawa affirmed this area to his reliable vassal. “… In 1872 [after the Meiji Restoration], in order to promote modern agriculture in Japan, the government established Naito Shinjuku Experimental Station in the area. In this station, extensive studies were practiced such as the cultivation of fruit and vegetable, sericulture, stock farming, including Western technique and species. And in 1874, it was placed under the authority of the Department of Interior and the new educational institution for agriculture was established. “Hayato Fukuba became the chairman of Shinjuku Imperial Garden in 1898, and it was he who introduced three big works of chrysanthemum to the 1901 International Exposition held in Paris in 1901 where the works were very well received. Conveniently, Fukuba invited Henri Martine, the professor at Versailles Horticultural School, to remodel Shinjuku Botanical Garden into a landscape garden. 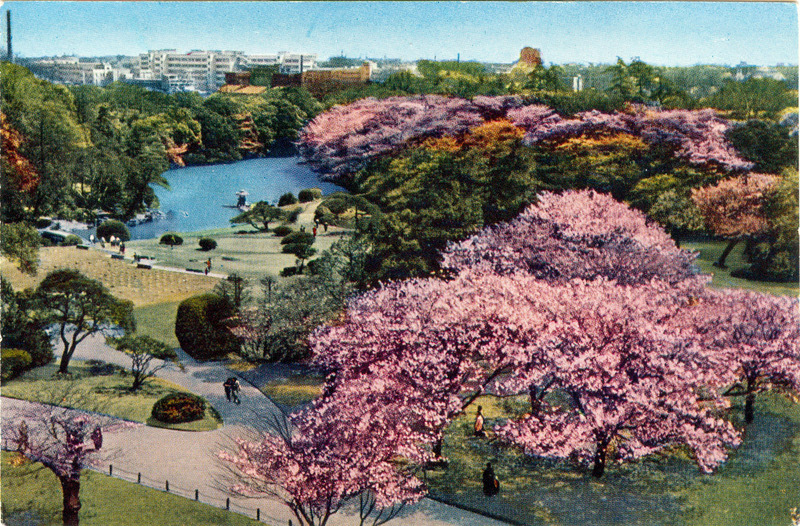 Shinjuku Gyoen (Garden), Shinjuku, c. 1960. “… Shinjuku Gyoen National Garden [has] played a role as the garden for the Imperial household, continuing to supply the cuttings and seeds of buttonwoods (sycamores) and tulip trees (liriodendrons). The gardens were also established for the party of watching cherry blossoms since 1917 and for the party of watching chrysanthemums since 1929. 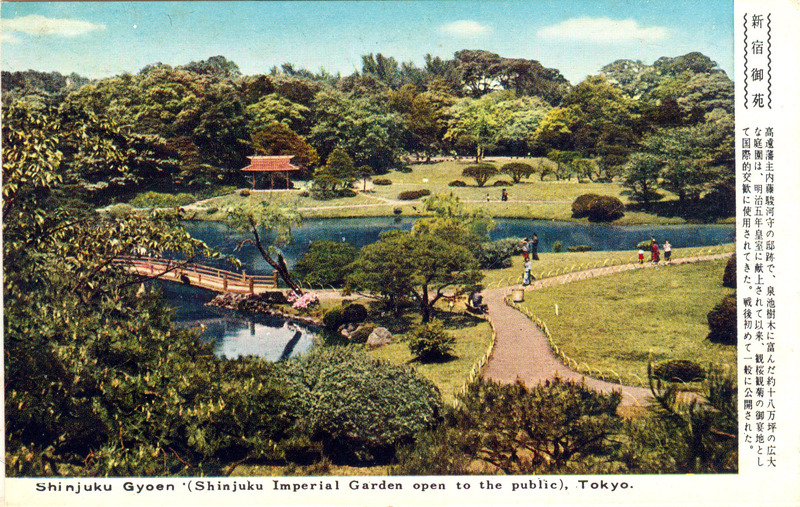 Also, during Taisho era [1912-1926], the Western garden was used for nine-hole golf course.